I’ve always wanted to travel to Japan—not to the crowded, hi-tech cities, but to the peaceful countryside and gardens that I imagine from the Japan of yesteryear. Until that happens, I can always sit in my backyard, imagining myself among the floating cherry blossoms, playing my Koto—or actually, my iKoto from GClue. Strung Along: iKoto presents the 13 strings of the standard Koto with a choice of 11 scales. The Koto is a harp-like instrument of Chinese and Japanese origin. While many people may not be familiar with the instrument itself, undoubtedly everyone is familiar with its relaxing traditional sound. 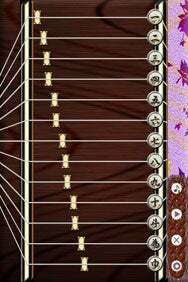 The iKoto app presents the 13 strings of the standard Koto with a choice of 11 scales. There is a demo mode that provides examples of basic techniques as well as some more advanced skills, such as pitch bending. You can even record your own songs and play them within the app or send them to your computer via Wi-Fi. I’ve created many songs and copied them to my computer, then to my iPod. This gives me a way to enjoy my songs while I’m working or relaxing. It would be nice if the developers would provide an easy way for iKoto musicians to share their creations with one another. Otherwise, iKoto is rewarding and fun, for both musicians and non-musicians alike. iKoto is compatible with any iPhone or iPod touch running the iPhone 2.1 software update.